Everyone loves the Honey Butter Chicken Biscuits from Whataburger, but why not make your own at home?! Chef Alex Hamman from the Louisiana Culinary Institute has the most amazing biscuit recipe (seriously, they call him King Biscuit) that he makes every Friday for faculty. I asked him if I could utilize it to make a Molasses Mustard butter chicken biscuits and he was all for it. 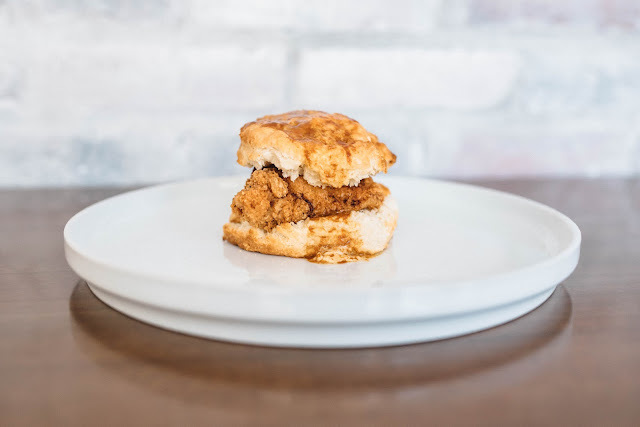 The fluffiness of the biscuit is harmonious with the fried chicken breast and the Molasses Mustard butter sends it over the top. The biscuit dough also does very well in the freezer if you want to make a batch of biscuits and save them for a rainy day breakfast. Preheat oven to 375°F. Keep all ingredients as cold as possible! In a medium mixing bowl, combine both bread and cake flour, baking powder, salt and sugar from the biscuit ingredients. Using a pastry blender or your hands, cut cold butter into flour mixture until butter is the size of peas. Add buttermilk and mix with your hands until shaggy. Cover and rest for 20 minutes. Roll out dough on a floured surface and fold once (to create layers). Roll out again to 1-1¼” thick and cut into 3½” circles. When cutting biscuits out, DO NOT TWIST CUTTER. Just simply press down and lift cutter back up. Place biscuits about ½” apart on greased baking sheet and bake until golden brown. Heat canola oil to 350°F in a skillet or table-top fryer. Dredge chicken in seasoned flour, place in egg-wash, then dredge back through flour. Fry chicken until golden, brown, and delicious (about 4-5 minutes). Soften butter and mix in Jay D’s Louisiana Molasses Mustard. Open biscuit up and slather butter on both halves. Place fried chicken breast on biscuit and put the other half of biscuit on top of chicken and enjoy your chicken biscuit sandwich!